The fact is most aspiring business owners don't know what they don't know until it's time to use that missing knowledge while they are deep into trouble. The truth about new businesses is the number one reason for their failure is ignorance, not money, bad idea or poor employees. It's ignorance. If owners are better equipped intellectually they will know what to do when difficulties arise, whether money, creative obstructions and lethargic employees. Period! You don't throw more money at a problem without proper education. That's what we do here at Beauty Supply Institute and that's what we ensure you will have. Can you thread an entrepreneurial needle? That's what it takes for success. It takes precision; the precision we ensure you have. This submission is for store ownership questions only! No solicitations. Please respect. ​​Our organization consists of Training Operations and Field Operations. Our Training Operations is designed to give you all the necessary training to get you well on your way to opening a store on your own. Our conferences, products and online courses fall under this division. Our Field Operations handles all of the tasks necessary to getting your store up and running or making existing ones better. Site Reviews, Store Opening Delivery and Consulting fall under Field Operations. Devin Robinson launched 3 beauty supply stores in the Atlanta area with no beauty supply experience. Armed with intense business knowledge, he was able to succeed at opening 3 stores within an 18-month period after an unfavorable experience shopping at an Asian-owned store. He designed a business model used in each store that caused each location to be largely successful employing 18 full-time and part-time employees. After witnessing the industry politics personally and the success of his stores he decided to "pay it forward" by sharing his best practices with other aspiring entrepreneurs. His best-selling book "How to Become a Successful Beauty Supply Owner" garnered industry attention and landed him on national media platforms such as Ebony magazine, Black Enterprise magazine, Michael Baisden syndicated radio show, Sirius XM, Radio One, Fox, NBC and more. He is an adjunct business & economics professor at two universities, teaching some of the toughest business courses in business programs to include: Industrial Economics, Government Economics, Environment Economics, International Economics, Business Ethics, Small Business Management, Retail Management and more. His ability to construct and deliver business-related material using his mixture of theoretic knowledge and vast business experience naturally allowed him to create Beauty Supply Institute and replicate his success in others. 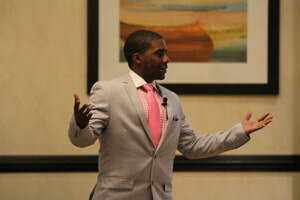 He is a regular panelist at beauty and business expos and organizes the annual Beauty Supply Entrepreneurship Summer and Winter Conferences (www.beautysupplyconference.com). He holds a Bachelors in Business Management, Masters Degree in Business Administration and is earning a Doctorate in Business Marketing. He resides in Atlanta, Georgia.